BABY KICKS: This 30 minute sports playgroup is taught free of charge to members under the age of 2yrs. All sessions are taught in the shade and in wide open spaces where your toddler is free to kick and run to his or her own desire. KIDDY-KICKS: These 45 minute sessions feature full parental participation and are geared towards children aged 2-3yrs and 3-4yrs. Children will learn to use different parts of their feet and body to control, dribble and kick the ball with their parents by their side the whole time. JUNIORS: These sessions are geared towards children aged 4-5yrs and are 60 minutes long. JUNIORS sessions only feature parental participation during the first 15 minutes warm-up. The second portion of the session progressively introduces the rules of Soccer to children and features small sided 2v2 and 3v3 matches in a friendly and strictly non-competitive environment where passing, cooperation and sportsmanship is encouraged above winning at all times. BKK GALAXY training sessions will continue to teach new dribbling techniques via drills with parental participation, and will also introduce the concept of Passing &Space Awareness which is vital to playing 3v3 and 4v4 matches. What happens at a KIDDY-KICKS training session? During each week's 45-minute session, each parent-child pair is introduced to five mini-games: a warm-up game, a technical game, either a competitive game or a teamwork game, an all-out crazy fun game, and finally a warm-down stretching activity before the trip home. How is my child's unique stage of development addressed? 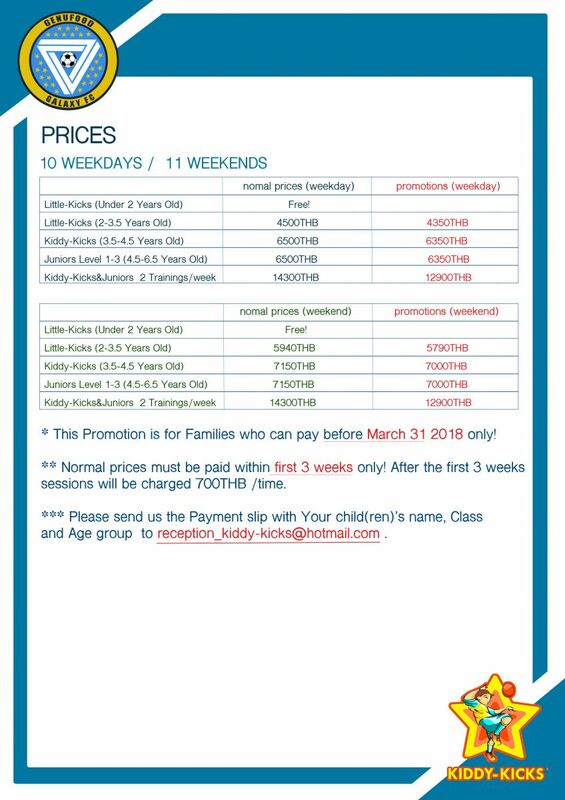 At Bangkok KIDDY-KICKS, each child has his/her own personal coach: the participating parent! Who better than a child's parent could be aware of his or her individual strengths and challenges? One-on-one time with a parent heightens a young child's enjoyment of the activities and brings out his or her best efforts, maximizing his or her progress. What will my child gain from the training activities? Learning to play soccer means acquiring a bank of physical, intellectual, social and emotional strengths. The Bangkok KIDDY-KICKS football program fosters all aspects of your child's development. Among the many rewards children take home from their KIDDY-KICKS participation are improved coordination, gross motor skills, speed, accuracy, balance, power and endurance; color recognition, numeracy, patience and concentration; team spirit, an appreciation for structured play, the ability to follow instructions, understanding the benefits of having (and following) rules of the game; responsibility, respect and tidiness; self-esteem and self-confidence. And, of course, a love for healthy outdoor activities with parents and an enhanced relationship with them! And how about us parents? What's in it for us? You will learn by experience that participating in 45 minutes of structured activity with one's under-six child can be fun for Bangkok parents, too! By the end of the year, you will have acquired a bank of fifty-plus fun activities you can engage in with your child at home, strengthening the bonds between you. As you witness your child's continual improvement, you will also have the satisfaction of knowing that you have played an active role in his or her success. How do I enroll my child into the Bangkok KIDDY-KICKS football and sports training program? Enrolling you child into our Bangkok KIDDY-KICKS program is very easy. Simply visit the 'Booking' section on our website and follow the 3 steps. If a class is fully booked is there a possibility of getting on a waiting list? Yes. It is possible for children to get on a waiting list for their preferred class. Simply enroll your child online in the desired class through the 'Booking' section of our website. If the session is fully booked you will be asked whether you would like to be put on the waiting list. Getting on the waiting list is free of charge. Does KIDDY-KICKS offer a free trial session to all newcomers? Yes. As long as you have contacted us in advance by email or phone call and we have approved the free trial date, all first timers are offered a free trial. A second free trial is also offered in the event of the child not participating at all during his/her first free trial (this happens on occasion especially with the younger children and we fully understand). Can my child join mid-term? Tell me about the fees payable? ** First timers may enjoy a free trial anytime throughout the year before becoming a member. If my child misses a class this term, can I book a make up class the following term? No. All make up classes must be scheduled during the current term. Only KIDDY-KICKS members can book free make-up classes. Do open venue KIDDY-KICKS sessions run on Bank Holiday weekends? Yes. If your child is unable to attend please let us know and we will book you in for a make up session. Does KIDDY-KICKS have half term breaks? The KIDDY-KICKS sessions continue throughout the half term breaks. KIDDY-KICKS only breaks during the Winter, Summer, and Songkran holidays. Do the children require any special equipment for their sessions? All participating children are expected to show up to training in their KIDDY-KICKS uniform. Please bring sports shoes and water for both the participating child and the participating parent! Can parents leave the children with the coach? No. Parents must stay on site to clap, cheer on and participate in all activities. Are KIDDY-KICKS sessions for girls and boys? Yes! Currently the majority of children who attend are boys but girls enjoy KIDDY-KICKS too. Can siblings spanning different age groups be in the same class? As a rule no. Please contact us to discuss this further if you think your circumstances absolutely require this. If you are unable to speak to someone or cannot leave a message for a call back, please use the Contact Us page to get in touch. Can parents bring siblings to watch? Yes absolutely as long there still is an available parent to participate with the playing child.